(50+ seeds) 60 days. Detroit Dark Red Beets have robust flavor, intense color-bright crimson, with no white streaks or rings. Detroit Dark Red Beets are sweet and smooth-tasting. (50+ seeds) Delicious dark red beet that is particularly good for canning. 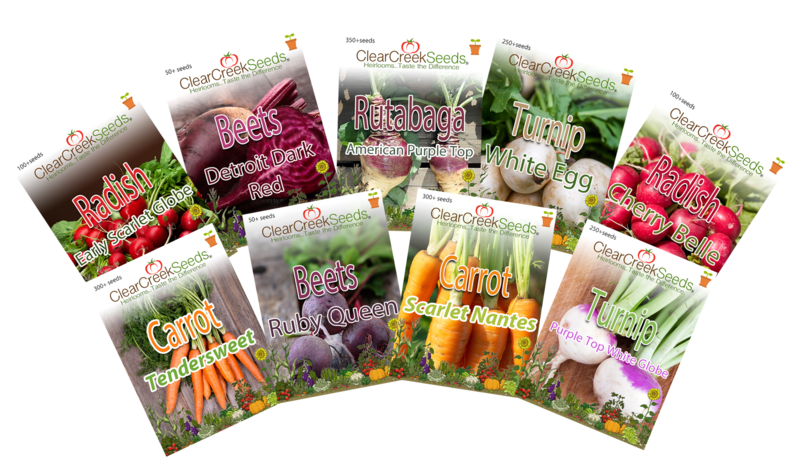 (300+ seeds) Popular as a sweet baby, slicer, or fresh market variety. A sweet and tender carrot with a cylindrical shape and blunt-tip. Scarlet Nantes have a bright orange-red color throughout. Very popular variety of carrot for eating fresh or cooked. (100+ seeds) this radish is an early mature that retains fine eating quality all season. Round, smooth, scarlet beauties, 3/4" inches across with crisp, white flesh. Cherry Belle is ideal for garnishes or use in salads. (100+ seeds) Very easy to grow. Use in salads or sandwiches, or simply enjoy them raw. (350+ seeds) Produces very large yellow roots with brilliant purple globes. The succulent flesh turns an orange/yellow color when cooked. (250+ seeds) this turnip has a fine grained root that can grow as big as a baseball! A great fall crop that gets better with cold weather. (250+ seeds) Produces attractive and delicious crowns. Plant just about anywhere, but this variety tends to thrive in the south.